This year, the 8th annual all Ireland final of the Farm relief Services Memorial Scholarship took place at the Teagsac Colleges Challenge Day in Clonakilty Agricultural College on Tuesday January 12th. 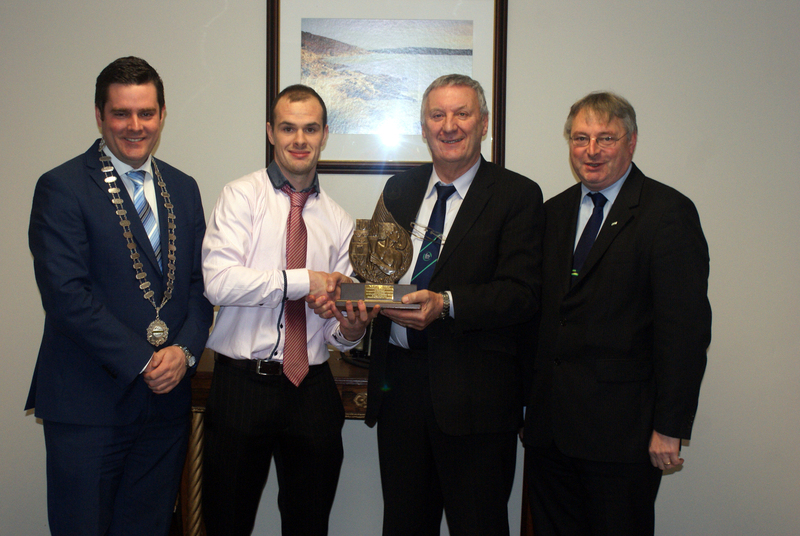 At just twenty three years of age, Charles Cooney, a beef and dairy farmer from near Shercock in Co. Cavan was this year’s National Winner of the Scholarship. The scholarship rewards students who show exceptional leadership abilities. Once he has completed his time in college, Charles will take up a paid placement with FRS to learn about business management. The Scholarship itself is run in conjunction with Macra na Feirme and a winner is selected to represent each Teagasc college as a National finalist. Charles represented the Ballyhaise college agricultural students. In the Final, Charles gave a presentation based on the leadership skills of a neighbour of his, Padraig McEnaney, who founded Celtic Pure Water, to a judging panel made up of Peter Byrne (FRS Network’s CEO), Séan Finan (National president of Macra) and Frank Murphy (Curriculum Development and Standards Manager with Teagasc). Peter Byrne, FRS CEO, said: “This is the eighth year of the memorial scholarship and FRS is delighted once again to give a dedicated student like Charles the opportunity to gain that all important work experience through placement with an FRS office. We like to play our part in the development of the agricultural industry and this scholarship is just one of the ways we contribute”. For more information about FRS take a look at the website www.frsnetwork.ie or visit the facebook page for constant updates www.facebook.com/frsnetwork .